It has been less than two months since the nationwide launch  of the Free Basics app in India. The smart phone application (formerly known as Internet.org) offers free access to Facebook, Facebook-owned products like WhatsApp, and a select suite of other websites for users who do not pay for mobile data plans. Free Basics, which has been deployed in 30 developing countries across the globe, gives users free access to websites that meet Facebook's technical standards for the application. The application does not give users access to the Internet at large. For open Internet advocates, this undercuts consumer choice  and violates the principle of network neutrality, under which Internet providers are to treat all Internet traffic equally. Net neutrality allows users equal access to any website they want to visit, and gives website operators equal opportunities to attract visitors. Facebook has responded to the pending regulation with an aggressive ad campaign  both online and off. Over the last week, Facebook users across India (and some in the US ) upon logging into the site have been greeted with notifications urging them to take action. The Free Basics  page on Facebook now leads to a pleading form that asks users to contact the Telecom Regulatory Authority of India  (TRAI) and voice their support for making Free Basics available in India. The company has also purchased a smattering of billboard advertisements across the country and taken out numerous two-page ads in leading national newspapers, as seen above. Indian netizens and activists have spoken out against the company's actions en masse, protesting  heavily on social media, blogs and newspapers. The grassroots open Internet group, SavetheInternet.in , that has been advocating for net neutrality in India throughout 2015, has launched an email campaign asking users to send letters to TRAI explaining how Free Basics violates net neutrality principles and propagates an inaccurate picture of the Internet for new users by placing it inside the confines of Facebook's application. The Free Software Movement of India, a non-profit promoting use of free software and its philosophy in India via their local chapters, also has taken  the campaign  to the streets where the volunteers raised public awareness about Free Basic's adverse side. Apart from local experts and activists, companies like Reddit, Truecaller and Indian e-commerce platform Paytm have publicly shared  their opposition to Facebook's actions. SavetheInternet.in explicitly states in their About page  that they are entirely volunteer-run and have no affiliation with any political party in India or elsewhere. 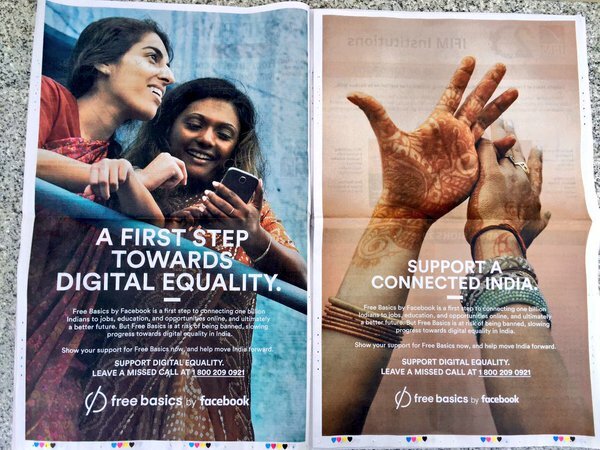 On December 28, Facebook CEO Mark Zuckerberg penned a piece in the Times of India  arguing that Free Basics will help “achieve digital equality for India,” and claiming that the initiative “isn’t about Facebook’s commercial interests.” India represents the world's largest market of Internet users after the US and China, where Facebook remains blocked.